Let’s dive right into this one while proudly admitting that it’s silly, dumb, and fun. Hockey’s best player and its most marketable player now have an enjoyable mini-beef going to spice up what’s been a pretty engrossing series so far. Maybe it was even a callback to last year’s playoffs, when Phil Kessel misunderstood a Pierre McGuire question about his breath? On Sunday, Subban was asked how his breath was that day. “It’s better, I guess,” he said, then noted that his teammates had left mouthwash in his locker for him. All of this is P.K. being P.K. He’s a good quote, but he’s also very good at reading a room—he realized reporters had jumped on this breath thing, and decided to keep going with it. There are players and executives in the league who aren’t big fans of the way Subban often manages to get headlines, but—and this is me speaking as both fan and media—I think it’s great. It gives us all something fun to talk about. The distraction (and I mean that word in its most pleasant, most useful sense) extends to cover his teammates too. 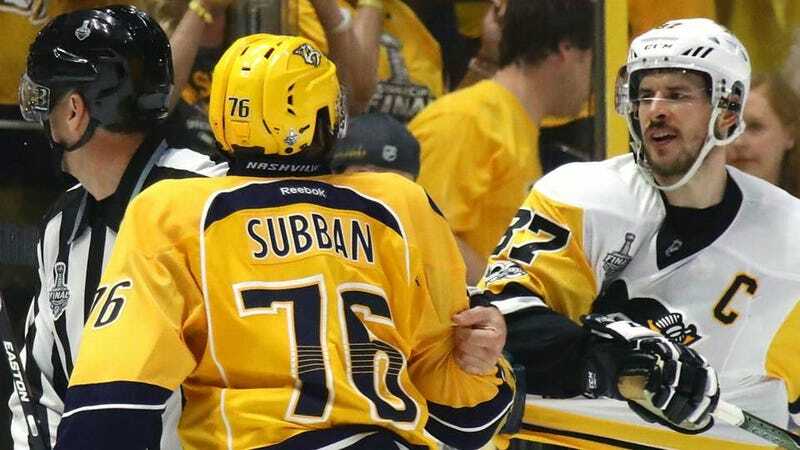 Roman Josi insisted Subban’s breath “smells great.” Pekka Rinne said Subban “always flosses.” For the Predators, Subban’s existence means fewer cameras and recorders in their faces. I guarantee you Rinne would a million times rather be asked about this than about whether his head is on straight following a bounceback game. Is it just me, or did Crosby seem genuinely ticked off by this? “He likes the attention, and things like that. If he wants to make stuff up, what can I do?” If he’s actually annoyed, well, then Subban would have to consider this a success. Maybe not as valuable a success as Crosby and Evgeni Malkin both being held without a shot on goal in Game 3, but victories come in many sizes.